Parents say their children’s lives will be at risk as a specialist school in South Tyneside looks to change its full time nurse provision. South Tyneside Council bosses have confirmed plans to replace a full time nurse at Keelman’s Way School, in Hebburn, with a children’s community nurse team. The school based, in Campbell Park Road, cares for children with a range of complex needs and parents say community nurses will only come in to school to administer medication and general care for a few hours a day and will not be able to carry out the hour-by-hour care provided by the current system. Some claim the move is financially motivated. A spokesman for the school said it was unable to comment on the issue at this time. Worried parents Karen Abraham, 37, and Brian Abraham, 42, say their seven-year-old son Michael’s life was saved by the school’s nurse when he had a seizure. Michael has intractable epilepsy which causes regular seizures. Karen said: “The school nurse saved his life. Michael had a seizure at school last year and choked, but the nurse was able to resuscitate him. Angela Moore, 47, has daughter Amber, eight, who has epilepsy. She said: “I just think the council are treating it like a mainstream school and that is not acceptable. “Parents were not consulted on the decision and it seems to be the most vulnerable children are going to suffer. 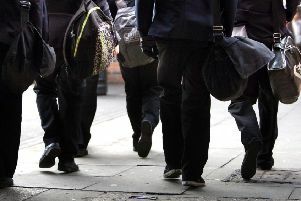 A spokesman for South Tyneside Council said: “We acknowledge parents’ and carers’ concerns and we would like to reassure them that children from Keelman’s Way - and all other special schools in the borough - will continue to have access to appropriate care while at school. “The public health nursing role is a public health function and is not a clinical or emergency care role so these changes are essential to safely meet children’s needs and are not financially driven. “These changes are being undertaken with the school which carries overall responsibility for the wellbeing and safety of children in its care. “Teams are already working together to ensure a smooth transition of care, with the children’s community nurse team now taking the lead for the clinical aspect of a child’s care. “Public health nurses will continue to provide a public health role in all schools.